Hi there! Thanks for your interest in professional photography services. All of my sessions with clients include digital images and print release. Your images will be safely uploaded to a private gallery that lasts 10 years online. Your gallery will be delivered within 3 weeks of your session. You'll have rights to download and print high resolution images. This give you flexibility over how you want to use and share your images. All full sessions are priced with a flat fee and all pricing is transparent and agreed to before your session. Your session can take place on location or in my studio. Outdoor sessions are booked based on location and time of day. I'm really spoiled to have a studio but I'll always prefer locations shoots. I like to schedule sessions one hour after sunrise or one hour before sunset but of course there are exceptions to this. As for the studio I prefer to schedule times around whats best for your little one. Studio hours are normally 9:30-3:00pm during the week and vary on weekend with other availability. My studio is located just five minutes from downtown Annapolis. My studio is full service and we have snacks, comfy seating, wifi, and netflix for you to enjoy. I want you to make yourself at home. I have a plethora of props, backdrops, and maternity dresses for you to choose from. If you are interested in touring please just let me know. I love visitors! Family sessions are available on location, at the studio, or in your home. Your children grow up so quickly and it's important to document these moments. This half session is short and sweet but not shot on shots. This 30 minute session includes one location and a gallery with 20 images. With up to 90 minutes of shooting time your session will be a lot of fun. We'll laugh and play and explore our location as we stop along the way to take photos. Session includes 40-60 photos. This is a great gift for the grandparents. 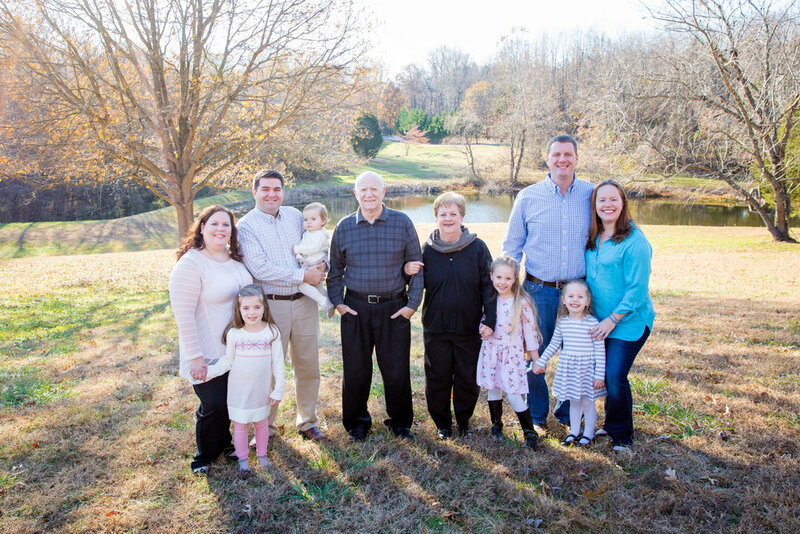 We'll photograph the entire group, grandparents with grandkids, each family, and each child. Perfect for groups of 10 or more. It's really exciting to celebrate your pregnancy. I would love to help you do this with a fun pregnancy announcement, maternity session, or gender reveal. What a special session for a special announcement. This includes your choice or pregnancy announcement or gender reveal. This can take place in studio or on location. up to 45 minutes. Galleries typically have 20-30 photos. It's time to document that bump - we can do in the studio or on location. I'm happy to cater to your every whim: whether you want a casual session or all out glam, I'm excited to work with you to bring your vision to life. All of our maternity clients have access to our extensive gown collection. These sessions are typically scheduled for when you are 32-37 weeks along. Your family and children are welcome for this session. Galleries typically have 40-60 photos. There are a couple different options to help welcome your little one to the world. I can come to the hospital for a fresh 48 session to capture those very first moments, or I can come to your home for your convenience, or meet me at my well equipped studio for a petite or full session. The standard newborn session is the most popular. It allows for the most variety during the sessions. It also includes parent and sibling poses which is a nice addition to your gallery. Right not new clients are 20% off which makes a standard newborn session just $500. Your baby is brand new and those fresh little details change so quickly. I will happily visit you during those first moments to document these details for you. Maybe it's the soft fuzz, or wrinkly forehead, or many it's big brother or sister meeting their new little for the first time. Galleries typically have 20-30 photos. Home is where the heart is and I'm available to capture that for you. During these session the goal is to document those real moments. These sessions are a balance of candid and posed images captured in beautiful light. Lifestyle sessions are really special with natural light. Galleries typically have 40-60 images. 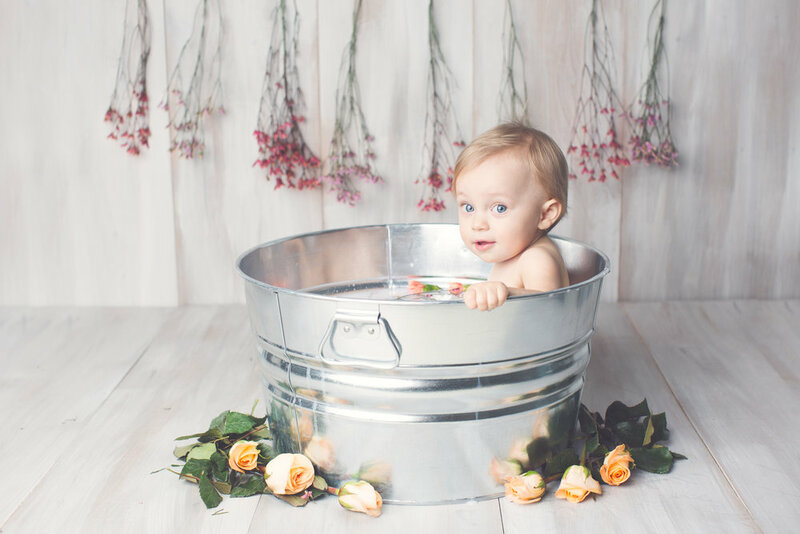 These small sessions are perfect to capture quality posed images of your new baby. Sessions last up to 90 minutes in the studio. You'll have access to our extensive prop collection. This session focuses on just the baby with wrapped poses and limited scene changes. Galleries typically have 20-30 photos. With up to 3 hours in studio we'll photograph baby, siblings, and parents. You'll have access to the prop room and we'll set a few different scenes. Galleries typically have 40-60 photos. 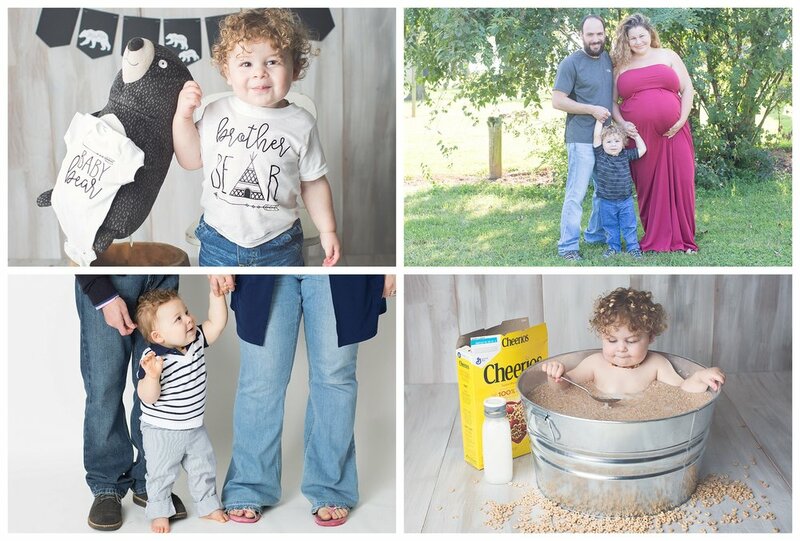 This is the most popular newborn session. It allows for variety as well as photos with parents. Before you know it they are lifting their head, sitting up, standing, and running! Let's capture these milestones along the way as your little one transistions from newborn, to infant, to toddler. It's a proud moment when a baby lift their head up, sits upright unassisted, and stands tall. These sessions document those sweet milestones. It also documents the change from infant to toddler. Galleries typically have 30-40 images. How is your baby already a year old? Let's celebrate with a cake smash! I'll provide everything but the cake but don't worry I have great bakery recommendations. 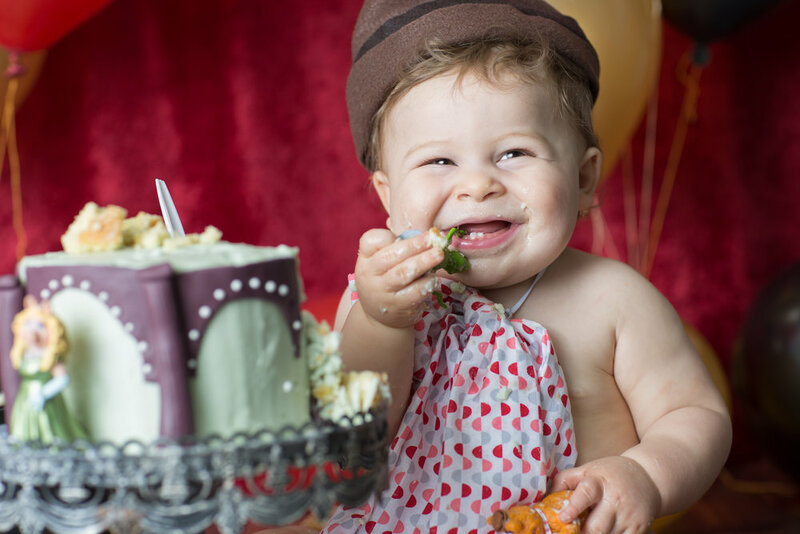 This session starts with family photos, then photos of your baby, then we get into it and smash a cake. Extra special we finish up with a warm water bath to rinse off and have fun with a little water play. Galleries typically have 60-80 images. Sometimes you just need a cupcake! Join me in the studio for a lighter sessions to celebrate a birthday or just because. Limited sessions offered once a month. You bring the baby and I'll supply the cupcake and fun party theme. 20 minute session in studio and galleries typically includes 15-20 photos. Fed is best and how you do that doesn't change the bond that is created during this time. Milk sessions document your feeding journey with a breast or bottle feeding session. These sessions are for any member of the family. These sessions take 15 minutes with a gallery of 15-20 images. Includes feeding session and bath session of your choice. Gallery typically has 30-40 photos. Bath sessions are extra fun! You can choose from bubble baths complete with rubber duckies or a milk bath with a special garnish of your choice. This is great for ages 3 and under. I'll fill a large tub with warm water and powered milk and then a garnish of your choice. We've done cookies, flowers, and cereal just to name a few. These sessions last 20 minutes and galleries typically have 15-20 photos. If you are interesting in documenting your baby as they grow we have different packages to fit those needs. Includes Maternity Session and Full Newborn Session. Includes Full Newborn, 4 Month, 6 Month, 12 Month sessions. Includes Maternity, Full Newborn, Two Milestones of your choice. Includes 5 sessions of your choice. Choose from Announcement, Maternity, Full Newborn, Milestone, Lifestyle, Fresh 48, Cake Smash, Milk Session. This is great for a family that wants to document a variety of special moments.